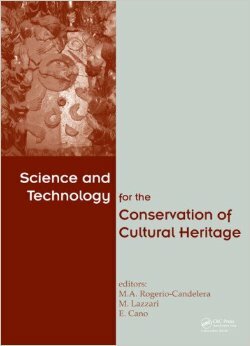 Miguel Angel Rogerio-Candelera, Massimo Lazzari, Emilio Cano, "Science and Technology for the Conservation of Cultural Heritage"
From 2nd to 5th October 2012 an International Congress on Science and Technology for the conservation of Cultural Heritage was held in Santiago de Compostela, Spain, organized by the Universidade of Santiago de Compostela on behalf of TechnoHeritage Network. The congress was attended by some 160 participants from 10 countries, which presented a total of 145 contributions among plenary lectures, oral, and poster communications. The congress was dedicated to eight topics, namely (1) Environmental assessment and monitoring (pollution, climate change, natural events, etc.) of Cultural Heritage; (2) Agents and mechanisms of deterioration of Cultural Heritage (physical, chemical, biological), including deterioration of modern materials used in Contemporary Art and information storage; (3) Development of new instruments, non invasive technologies and innovative solutions for analysis, protection and conservation of Cultural Heritage; (4) New products and materials for conservation and maintenance of Cultural Heritage; (5) Preservation of industrial and rural heritage from the 19th and 20th centuries; (6) Security technologies, Remote sensing and Geographical Information Systems for protection and management of Cultural Heritage; (7) Significance and social value of Cultural Heritage; and (8) Policies for conservation of Cultural Heritage. This volume publishes a total of ninety-three contributions which reflect some of the most recent responses to the challenge of cultural assets conservation.